You would agree that the pickle increases the taste of a food by a thousand times. Even a not so tasty food seems delicious if the pickle is added to it. But there is one thing making pickles is not everyone’s thing. It includes a tedious process that goes on for a longer time. Well, the good news is that it is a conventional method of making pickles that take so much time. Here we are sharing a very easy method of making pickles. Onion pickles are love! 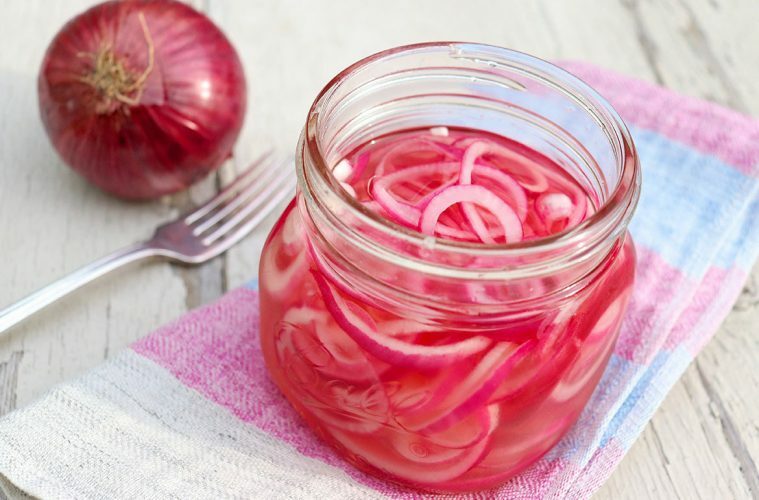 Who doesn’t love onion pickles? In order to make them you don’t need to switch on oven nor are you required to have knowledge of preserving. Just drench slices of white onions with red wine vinegar and then sprinkle some kosher salt on it followed by addition of sugar. After having all these ingredients stir them and let it be for 15 minutes to an hour. There are many hacks you can try while making pickles. Owner and Chef of Georgia restaurant Five & Ten Hugh Acheson state “If you want something to pickle fast, cut it more thinly.” He also tells the way to serve the pickle. He suggests “would you normally cook it? Hot brine. If you’d have it as crudité? Cut it finely and pickle at room temp.” What could be better than this! Yeah, there is more, you can pickle fruits also. Acheson clarifies “I love pickled plums, simply done with a rice vinegar and sugar brine.” He takes them in use to garnish pork chops. They can also be served with vanilla ice cream.Fruit also helps in cutting added sugar “remember that the sugar in most pickles provides balance,” says Acheson. He continues, “If the fruit or vegetable is naturally sweet, you can cut it down or omit it.” Now you know how to make these tasty pickles try them as soon as possible!